The following is a presentation that I made at the Canadian Economics Association Annual Meeting in Vancouver on May 31, 2014. The presentation was my opening comment on a panel discussion, sponsored by the Centre for International Governance Innovation (CIGI) and chaired by Paul Jenkins, former Senior Deputy Governor of the Bank of Canada. The topic for the panel was "Critical Challenges Facing Central Banks: Independence, Remit, and Communications". The other panelists were Paul Beaudry, Vancouver School of Economics, University of British Columbia; Douglas Laxton, International Monetary Fund; and Pierre Siklos, Wilfred Laurier University. Good morning. It was a pleasant surprise when Paul Jenkins asked me to be on this panel. I have written a lot in my career about central bank behavior, especially that of the Bank of Canada. First, as research director at the CD Howe Institute where I worked with Tom Courchene and Peter Howitt on their reviews of Canadian monetary policy in the 1980s. Second, as Chief Canadian Economist for JP Morgan, where I worked with economists around the world to forecast global growth, inflation, interest rates and exchange rates. Finally, as Managing Director of OMERS Global Macro Portfolio, where I headed up a team of strategists and traders whose objective was to invest in global stocks, bonds, commodities and currencies to achieve solid risk adjusted returns for the pension plan. 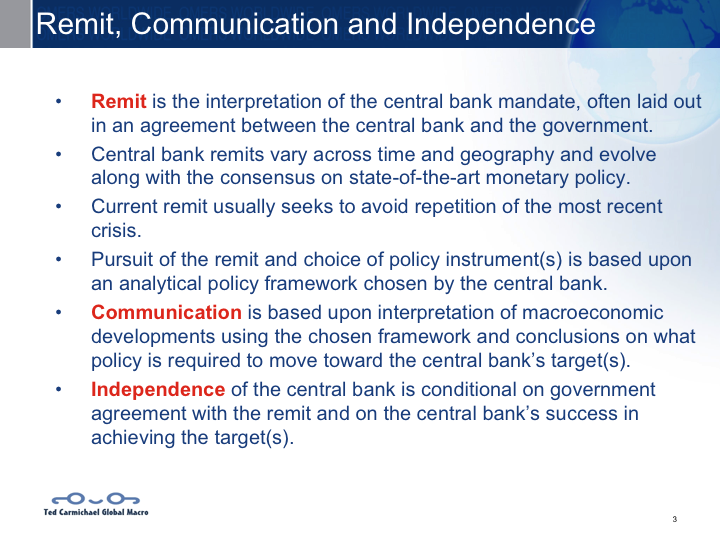 In all of these positions, it was important to understand the objectives and policy framework of central banks. At the CD Howe, my objective was to help provide policy analysis for public debate. At JP Morgan and OMERS, my objective was to apply that understanding to make money for clients or pensioners. After more than 30 years of watching monetary policy, I must say that today, I find it more challenging than ever. In this presentation, I will outline my views on the challenges facing central bank’s in establishing their remit, communicating their conduct of policy and protecting their independence. I will illustrate my case with quotations from central bankers who have reflected on these issues over the past 35 years. 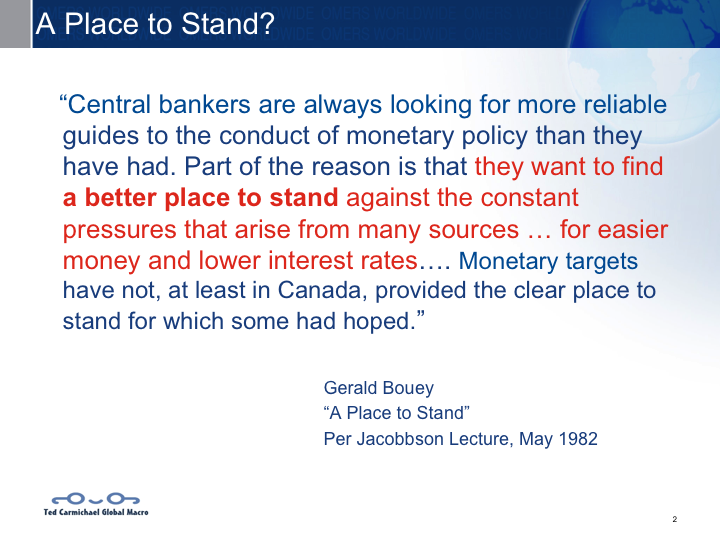 For a start, this quote is from a 1982 speech titled “A Place to Stand” by former BoC Governor Gerald Bouey near the end of his term which had been highlighted by the adoption of monetary targets. Bouey said that the BoC adopted monetary targets in the hope that they would provide “a better place to stand against the constant pressures…for easier money and lower interest rates”. In his speech, he outlined how financial innovation had caused instability in the demand for money with the result that monetary targets failed to provide a clear place to stand, from which the central bank could communicate how and why monetary policy actions were being taken and thereby maintain its independence. 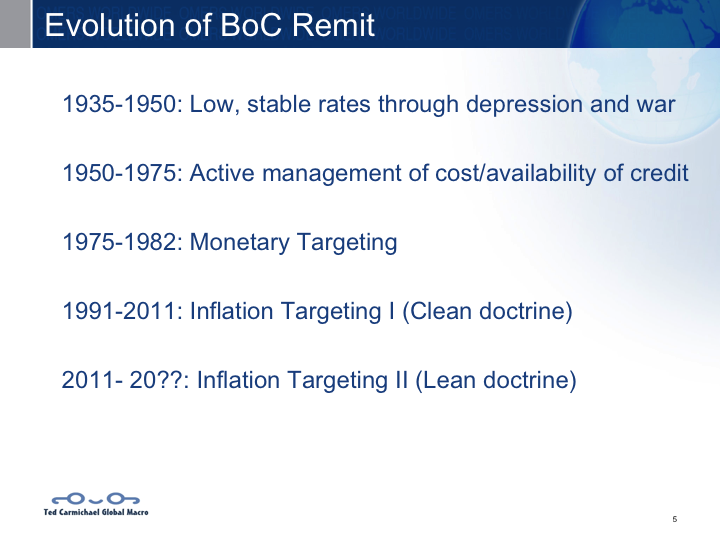 So let’s start with the remit, using the BoC as an example. 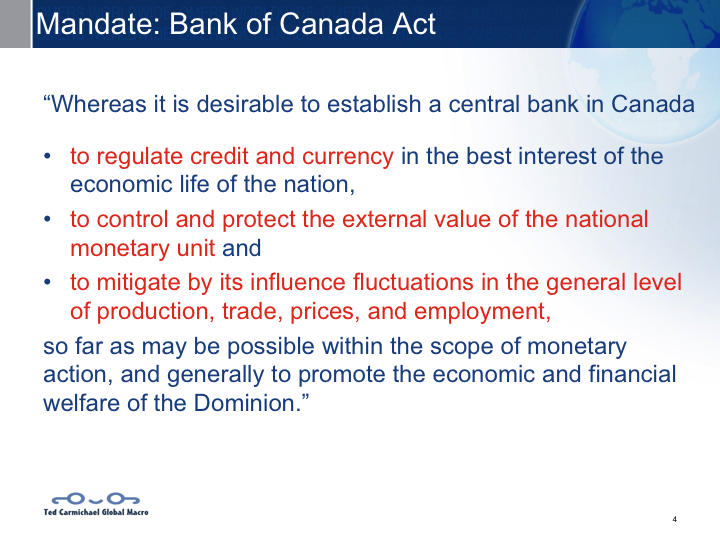 The remit is the currently agreed upon interpretation of the BoC’s mandate which was laid out in the Bank of Canada Act of 1935. To mitigate fluctuations in output, trade, prices and employment. Gerald Bouey explained in his 1982 speech that, up to that time, the Bank of Canada’s interpretation of its remit had gone through three stages. Since his speech, I would argue, there have been two more re-interpretations of the remit. During Inflation Targeting I, the BoC contended that hitting the inflation target was the preeminent objective of monetary policy. As BoC Governor Thiessen said in 1997, achieving the inflation target was “the best contribution that monetary policy can make over time to a well-functioning economy – an economy that delivers growth in output and employment”. 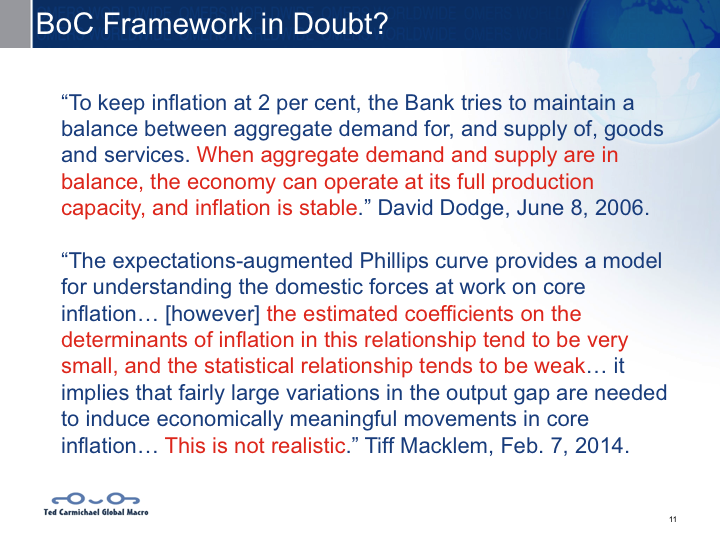 Bank of Canada communication during Inflation Targeting I consistently hammered home this message. This quote from BoC Governor Gordon Thiessen was repeated in various forms in many speeches throughout his term and that of his successor, David Dodge. Governor Dodge’s quote from a 2003 speech makes it crystal clear that the BoC agreed with the Clean Doctrine. The BoC saw its remit as using the policy rate to stabilize inflation around the target. It did not believe that it should target asset prices or attempt to lean against or pop asset bubbles. Another feature of BoC communication in the Inflation Targeting I era was the strong suggestion that the milder recessions and generally the reduced volatility of real output since the early 1990s – which came to be known as the Great Moderation – was, in large part, the result of the success of Inflation targeting in delivering low and stable inflation. This quote from a 2006 speech by BoC Deputy Governor David Longworth makes the point. 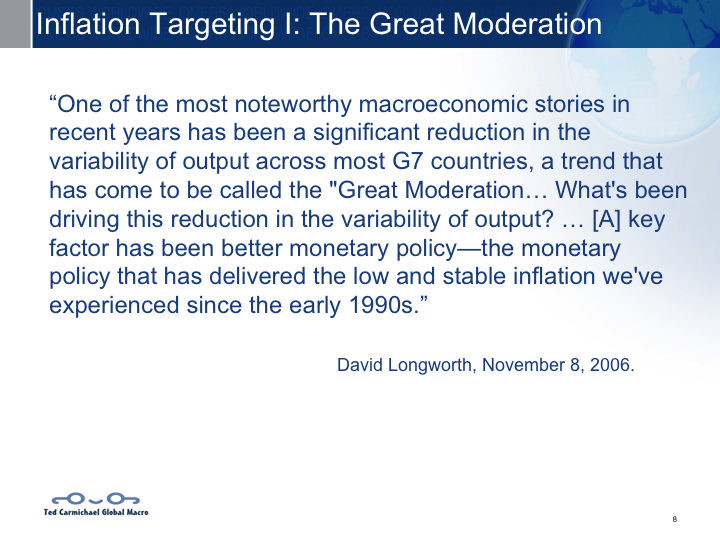 David Longworth's quote is very similar to a statement made in a 2004 speech by then Fed Governor Ben Bernanke entitled “The Great Moderation”, in which Bernanke said, “improved monetary policy has likely made an important contribution not only to the reduced volatility of inflation but to the reduced volatility of output as well… This conclusion on my part makes me optimistic for the future." (Ben Bernanke, “The Great Moderation”, February 20, 2004). One year after Longworth’s speech came the Great Financial Crisis – the worst episode of financial and macroeconomic volatility since the Great Depression. 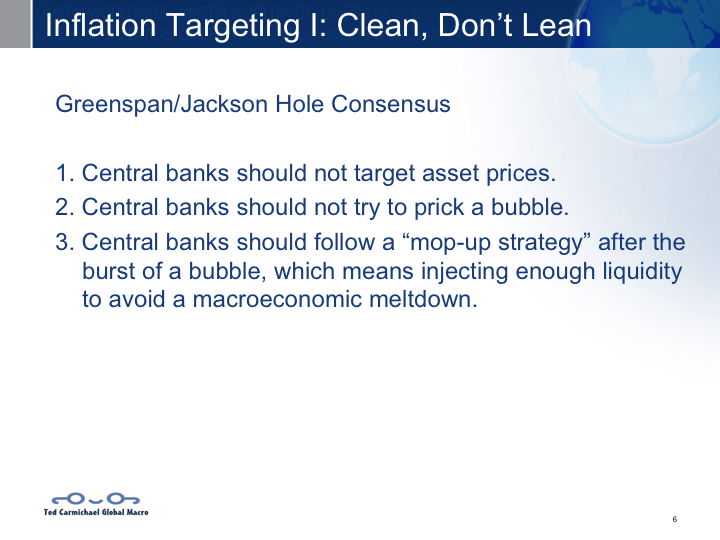 Central Banks that had adopted Inflation Targeting and the Clean Doctrine were challenged to clean up the mess. Policy rates fell to the lower bound in many countries and central banks adopted unconventional instruments including quantitative easing, credit easing, and forward guidance. 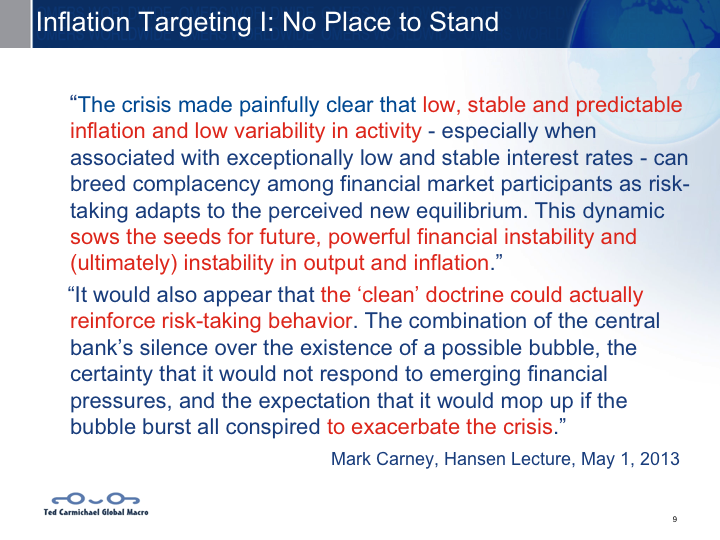 This quote by BoC Governor Mark Carney highlighted the shortcomings of the Inflation Targeting I and the Clean Doctrine. Carney argues that low and stable inflation combined with central bank promises to mop up the mess can actually sow the seeds of powerful financial instability which can lead to instability of output and inflation. It appears that adopting the Clean Doctrine had fueled risk-taking behavior and exacerbated the crisis. In Canada, the Inflation Targeting remit of the BoC was due for review and renewal in 2011 and this ushered in the era of Inflation Targeting II. 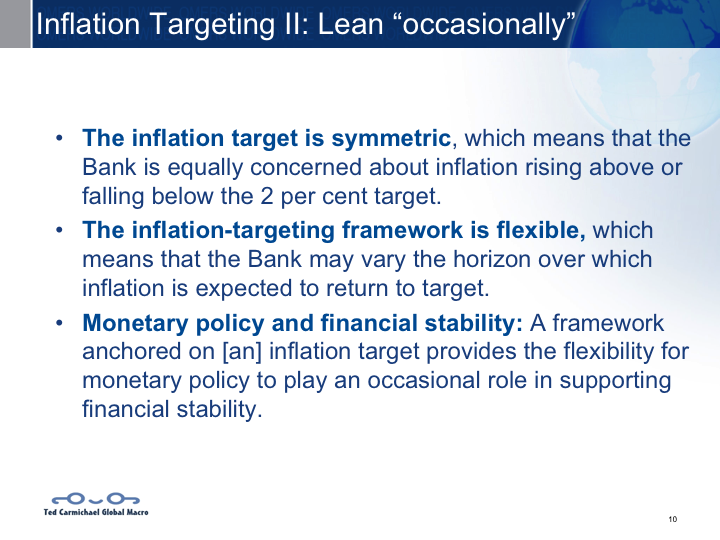 Some refer to this new remit as Flexible Inflation Targeting. The three key elements of the remit are shown in this slide. The significant change is contained in the third bullet. It suggests that the goal of returning inflation to the target may occasionally be altered to support financial stability. It suggests that the BoC may decide to utilize the policy rate to lean against possible asset price bubbles, which might lengthen (or shorten) the projected time path of inflation back to the target level. The difficulty with this change is that the BoC now has two stated goals – price stability and financial stability – but only one instrument, the policy rate. What is equally worrisome, is that the validity of the analytical framework employed by the BoC to communicate and explain its decisions during the Inflation Targeting I era is increasingly in doubt. 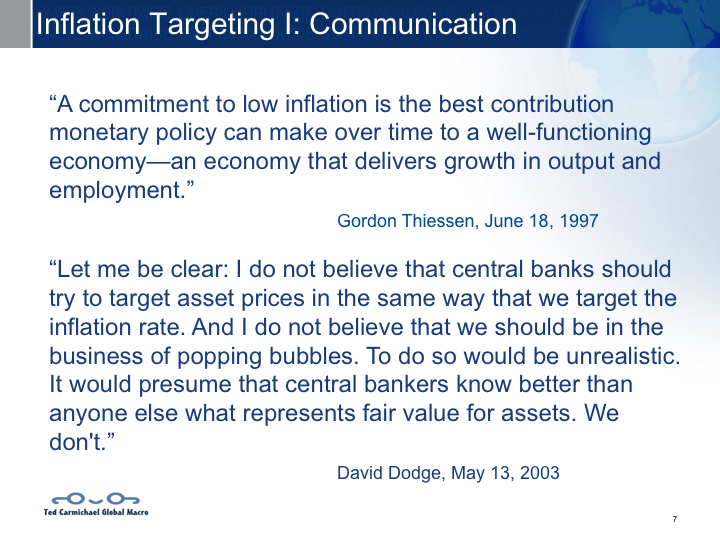 The first quote below, from 2006 by Governor David Dodge, lays out the simple Aggregate Demand-Aggregate Supply framework that has been the centrepiece of BoC communication since the inception of inflation targeting. The second quote from 2014, by outgoing Senior Deputy Governor Tiff Macklem raises serious doubt about the usefulness of the domestic AD-AS framework based on the output gap. Macklem’s speech pointed out that the dominant determinant of Canadian Total CPI Inflation is not the output gap but Total Global Inflation. Domestic factors are more important in determining Canadian Core CPI Inflation, but the coefficients on the determinants of core inflation are too small and statistically insignificant to be realistic guides to policy. 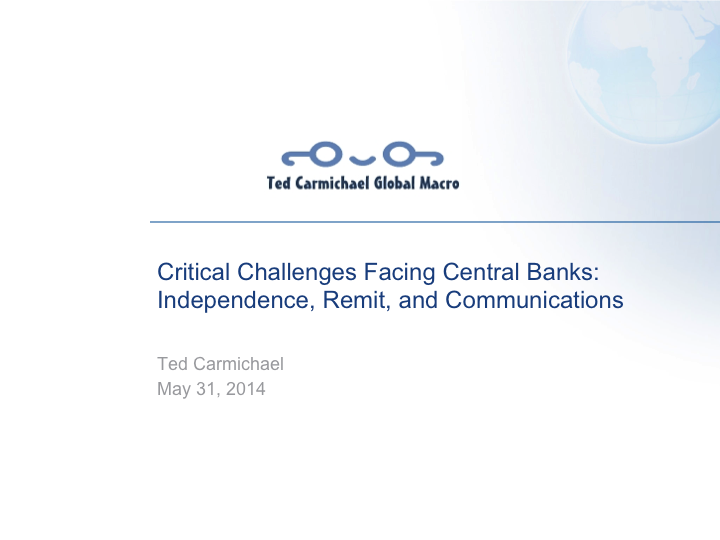 What are the implications for central bank independence? It is my contention that central bank independence is granted by the elected officials who form the government but that, once granted, independence must be continuously earned by successful execution of the central bank’s remit. This chart from a paper by former Fed Vice-Chairman Donald Kohn shows US polling results on the public’s confidence in Fed. In 2007, before the GFC, over 50% of the public said they had a great deal or a fair amount of confidence in the Fed, while only 25% said they had only a little or almost no confidence. By 2012, almost four years into the recovery, just 39% said that they had a great deal or a fair amount of confidence, while 47% said that they had little or no confidence. 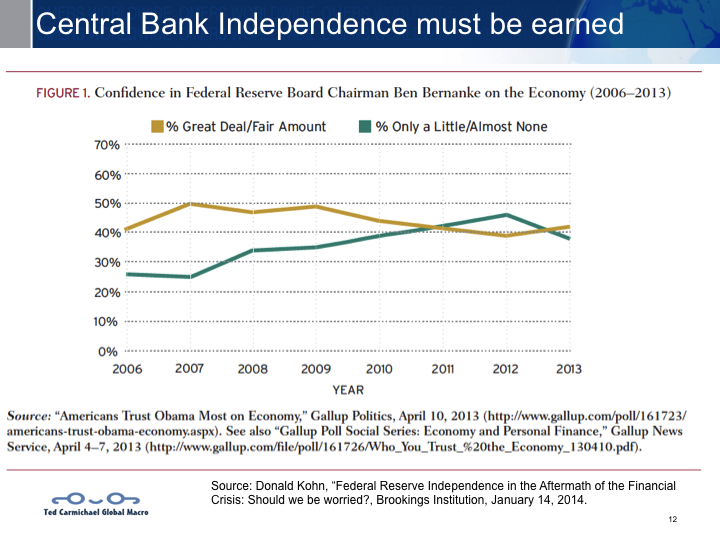 This explains why the Fed has been concerned about threats to its independence. 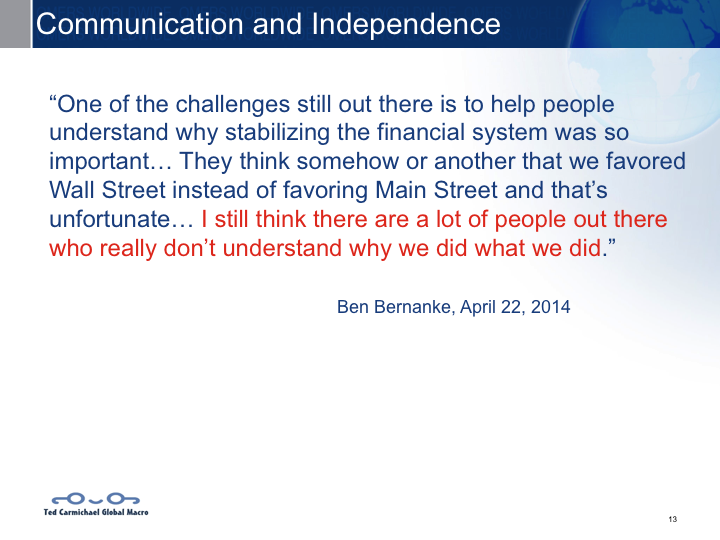 Even though the Bernanke Fed must be given much credit for the steps it took during the GFC to avert a much bigger financial collapse, this quote is evidence that the consensus on the central bank remit, the clarity of the communication of monetary policy, and the independence of the Fed and other central banks have suffered. I close with this slide. 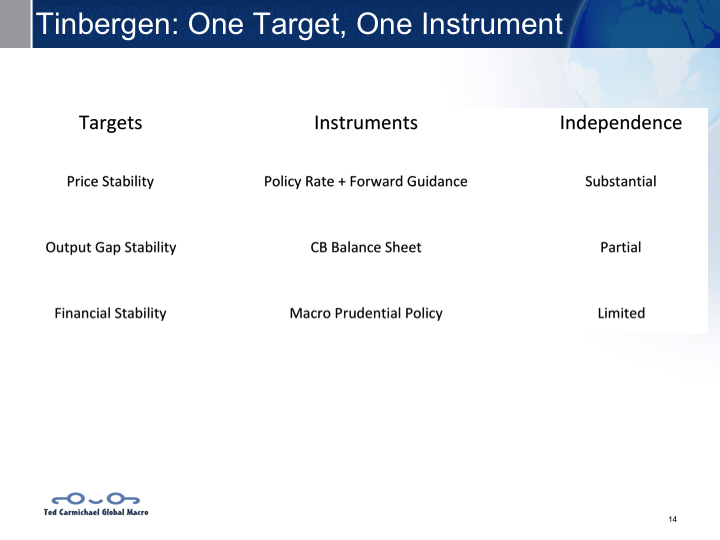 Tinbergen’s Rule holds that consistent economic policy requires that the number of instruments equal the number of targets. More targets than instruments makes targets incompatible. More instruments than targets makes instruments alternative; that is, one instrument may be used instead of another or a combination of others. Central Banks have been tasked with multiple objectives, not just price stability. They have innovated through the increased use of non-conventional instruments. In the process, they have not kept a clear identification of which instruments are to be used to pursue which targets. In addition, some of these instruments were never intended to be wielded independently by central banks, especially those involving private asset purchases and macro-prudential policies. The world is much more complicated than it was widely believed to be during the Inflation Targeting I era. Like Gerald Bouey in 1982, I would conclude that unfortunately, inflation targeting has not provided the clear place to stand for which some had hoped. Very insightful. I suspect that policy gridlock in the US and Europe has forced some of the macro-prudential policy-making aimed at financial stability into the central banks. It is more curious why that might take place in Canada. I agree that the macro framework that the bank uses to set policy is imprecise and estimation of the coefficients that describe the inflation process provide an incomplete picture. Unfortunately they are all that we have, and will continue to form the BOC policy process. In an effort not to allow a housing bubble to form, the BoC raised the policy rate to 1%, ahead of the Fed. And when inflation fell below target for over 20 months, the BoC took no action, clearly breaking the part of the remit that says inflation targeting is symmetrical. For the past two years, any assessment of the BoC's likely action has had to take account of the outlook for both inflation and housing. Two targets, one instrument. The targets are incompatible. I agree that they are incompatible. I suspect that they are hoping for a soft landing in housing at which point they can pragmatically abandon the financial stability target and return to purely inflation target. But sometimes hope is not a very effective strategy. Great post! Ted, please broadcast your thoughts on Twitter as well. The metronome of policy rates going up after they have come down has ended. Why so few policy makers articulate Japanization as a possibility 6 years after the Great Recession has more to do with massaging expectations and hope than reality. Upon reflection, the BOC (and other central banks) will, perhaps, admit one day that price stability during the so called Great Moderation had more to do with globalizing forces and less to do with policies targeting a nominal anchor but that is probably a long shot.